Today’s guest is Mike Grogan, who works for CCBRT, a medical relief clinic in Dar es Salaam, Tanzania. This episode is particularly inspiring…Mike’s answers stayed with me long after our conversation was over. If you enjoy listening to podcasts chances are you’ll also enjoy listening to audio books. And if you’ve never experienced how incredible an audio book is to listen to today is your lucky day since you’re able to download a free audio book over at our favorite audio book provider – Audible. Simply click this link to claim your free audio book. Announcer: You’re listening to Episode 15 with Mike Grogan. Welcome to the Gemba Academy Podcast! The show that’s focused on helping individuals and companies achieve breakthrough results using the same continuous improvement principles leveraged by companies such as Toyota, Del Monte, and the US Department of Defense. Now, here’s your host Ron Pereira. Ron Pereira: Hey there! 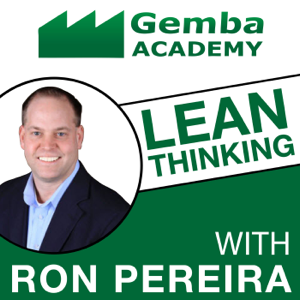 This is Ron Pereira with Gemba Academy, and I’d like to welcome you to another episode of the Gemba Academy Podcast. As always, thank you so much for taking time to listen to the show. We truly do appreciate each and every one of you. Today, I’m excited to welcome Mike Grogan to the show. Mike, as you’ll learn is doing some incredible work in Tanzania, Africa where he’s primarily working with hospitals. As you’ll soon hear, Mike is extremely passionate about the work he’s doing, and is without question an incredible example of what it means to truly respect people. Next, I wanted to point out that we’ve recently formed a new partnership with audible.com. If you’re interested in downloading a free audio book, definitely check this episode’s show notes out for all the details. These show notes can be found over at gembapodcast.com/15, which is 1-5. It’s gembapodcast.com/15. Finally, I truly believe in being as transparent as possible, even when mistakes are made. Unfortunately, I didn’t follow my own standard work when it came to recording this episode. Specifically, we use Skype to record these interviews. Within Skype, you have to select a microphone that you’d like to use. We’d just gotten done with our morning Gemba Academy team Skype call, where I used my Mac’s Thunderbolt monitor, the microphone in the monitor, so all the other folks in our studio can talk to our colleagues around the country. Guess what? I didn’t reselect my fancy studio mic that I’m using right now for the podcast. I was actually using the Thunderbolt microphone, so my audio quality isn’t quite as good as it normally is. I apologize for that, but my part of the show isn’t as important as what Mike shares. We’ll just chalk it up as an excellent lesson learned and move on. Enough from me. Let’s get to the show. All right, Mike. Thanks so much for coming onto the show. Where are you calling in from today? Mike Grogan: I am calling in from sunny Tanzania in East Africa. Ron: I think that you definitely win the award for being the furthest away to do a podcast so far with us, so fantastic! We’re going to explore why it is that you are in Africa here in a bit, but before that, talk a bit about your background, who you are, Mike, and your experience. How you got into this whole continuous improvement thing. You do have an interesting accent, so maybe you could talk about that as well. Mike: I’m originally from Ireland, which is the give-away for my accent. I was first exposed to lean thinking continuous improvements back in 2006. I worked for a local pharmaceutical company for seven-and-a-half years and they were going through, or experimenting with lean thinking. That company was Merck. I spent three years with them in the UK. I did another three-and-a-half years with them in Philadelphia, in Pennsylvania. 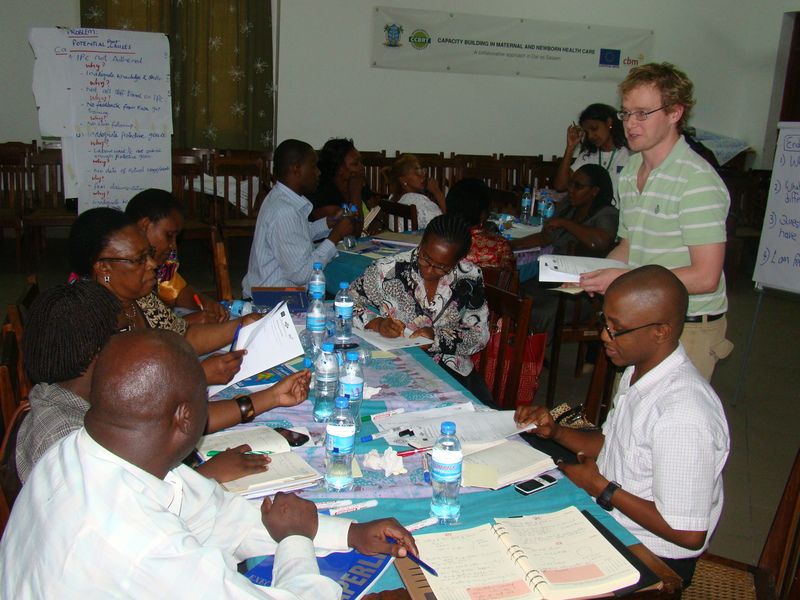 From there, I decided to move on to take the vast body of knowledge that I learned, and to join a not-for-profit healthcare provider here in Tanzania. In a sense, I’m a child of manufacturing, Lean Manufacturing, and in the last two years I transitioned into spreading this thinking into healthcare, and in particular, in the African healthcare system. I feel very fortunate to get exposed to this in my career. Ron: We’re going to really think that’s obviously the whole spirit of this episode. Before we get into that, Mike, we like to start all of our shows with our guest sharing a quotation, perhaps it’s Lean or leadership, anything that’s related to that kind of side of the world that inspires you. What quotation inspires you, Mike? Mike: For me, if I had to pick one, I would say, “People don’t care how much you know until they know how much you care.” I first heard that from reading John C. Maxwell’s material, but Theodore Roosevelt was the originator of that quote, or whatever originator means. For me, it is a powerful sticky quotation that has stayed with me in my career in terms of the importance of relationship, and trust in a leadership, or coaching role. Ron: Let’s just get into it because I’m dying to learn more. By the way, just so all the Gemba Academy customers know, Kevin Meyer, my business partner and co-founder of Gemba Academy, was recently in Africa with his family. He met up with Mike and they actually shot some video together. That hasn’t been released yet. This podcast will definitely be out before that video is released. From what I understand, I haven’t actually even seen it yet, Mike, but from what I understand it’s some powerful stuff. First of all, thank you for doing that, Mike, and opening your doors to us and our video cameras. Let’s just start, Mike, with at a high level why are you in Africa? What are you doing there? Are you part of an organization? Are you there on your own? Just give us a little bit of background. Mike: Yeah, this is the same question my mother asked me. What am I doing here? Mike: …was the reason I found out that Kevin was in Africa. I asked Steve to reached out to Kevin. Would you believe he came in for about six hours, him and his wife, to our facility? We got to do some video footage which was beautiful. It really was. To answer your question of why I came here, I first came to Africa as a tourist back in 2010. When I lived in England one of my roommates was Tanzanian and his sister was getting married. He invited me as his friend to come to that wedding. For me, I was a child of the west. I had never left Europe or North America. It was the first time out of that comfort zone. I certainly stuck out at the wedding. I was the only non-Tanzanian at the wedding. [laughs] So you can imagine what the photos looked like. For what really took out for me…What made that trip special and very impactful? It was the first time I saw women and children in poverty. The consequences of not having the opportunities that you and I and more so our listeners were blessed with. I never really appreciated that to that level, and what I saw with my eyes and heard the stories, it just devastated me. It left something imprinted inside me that I needed to do something. It took me a while to finally know that that something was to actually quit the US and move full time to Africa. I went a year later for two weeks to volunteer. Then I went another year after that for five weeks to volunteer. The experience was the most, was the greatest work I’ve ever done in my life, and a sense of fulfillment and a sense of purpose. Ron: Let’s go back to that first trip that you went on as a volunteer. What did you do on those first few trips? What kind of activities were you doing? Mike: [laughs] When I reflect on it now, I laugh about how ineffective I probably was. In a sense, I did primarily PowerPoint. “Death by PowerPoint” as I sometimes joke about. I essentially tried to focus on one topic and it was just introducing what I introduced to them as scientific problem solving. Different names, Deming, Kaizen, PDCA, however we wanted to phrase it, the scientific method of problem solving. Ron: So you did start with guns blazing, if you will, with continuous improvement? Mike: Yeah, I went straight in and introduced how you could. It was all theoretical because of the limit of time we didn’t get to use this theory on an example. But the feedback I got…half the time was classrooms and the other half was one-on-ones. But the feedback I got from the colleagues in that short two weeks was that this was useful. Ron: Who were you teaching? Who were you working with? Mike: I got connected to a small not for profit hospital in the city of Dar es Salaam. It’s bizarre how these things work, but a friend of mine in church who is Tanzanian, her cousin was a professor in Dar es Salaam. One of her students was the CEO of this healthcare provider and essentially through that connection my invitation letter got sent to him. He was excited. We did a two-week experimentation and the feedback was, “We want you back.”Actually, on my last day there, he offered me a full-time job. To be honest, I was too scared to leave. It took me a year later procrastination and self-doubt to finally realize that was the right thing to do. Ron: Do you remember the first improvement that you guys ever made? Mike: The first improvement that I always involved hands-on with was in my second trip. Learning the lessons from my first volunteer trip, the second one trip was focused on issue on procurement. Essentially, with another colleague of mine, Emily, together we did facilitate an improvement event, workshop, whatever different names we have for us. As well as doing training on this time, I introduce them to the management systems with…I focus less on training and more hands-on work with them on the application of problem solving in procurement issue. The problem they had was a stuck out, essentially good. Application with scientific method, we help them address that problem. Essentially, one of the biggest takeaways that I got from feedback from the colleagues was that concept of gold seat just to help them in how to see ways and how to see the gaps, both in the operational standards and then the management standards. That gave me a lot of satisfaction from that event we did. It was a big two-week event that the tangible improvements can’t prove enough, just improvements that change the processes but of course the greatest improvements. Maybe that’s planting a seed for a change and thanking and potentially inhabits. Ron: At high a level, what’s it like teaching Lean in a developing world, especially in the world of healthcare in the developing world? Mike: Notice expect to my manufacturing colleagues was I’m a child of Lean manufacturing. What healthcare gives me, let me just answer for healthcare, is that extraordinary sense of contribution, because we’re so close to patient. When I worked in pharmaceutical manufacturer, yes, I was proud of the healthcare system but very much off-string in terms of back scene and talent manufacturer. In healthcare, every single day, we have work in a disability hospital and we’re building maternity hospital to see…knowing that your work is contributing to adding a better quality, better quality and a safe outcome for that child or a mother, it just gives you extraordinary job satisfaction. I think that that feedback loop is more apparent in the healthcare industry. Ron: What about the developing world side of things? Obviously, working in a hospital in Dallas, Fort Worth is going to be different than [laughs] Tanzania, right? Mike: Yeah. Many Westerners may answer this question very differently. I reflected a lot on that. Even my answer a year ago would have been…My answer today is very much different than my answer a year ago. The key thing is meeting people where they’re at. It’s so easy to come here. Just like Kevin a few weeks ago and compare our hospital here with a hospital in North America, if you get into that comparison trap, it’s very dangerous, because there’s so many gaps. There were so many gaps. In terms of quality, we just even pick one metric of maternal debts. In some cases, it’s 500 times what it is in a hospital in North America. It’s tragic and heartbreaking. I try and help meet people where they’re in. Always remember, it’s not that people I work with have less time with me. Absolutely not the case at all. I was coached for two years. I would’ve said I had worked for big multinational company that poured so much into my own development. I’m so fortunate, and that you are not at a higher level, I have two great parents, the best gift I ever got in my life. Not everyone would get those luxuries whether they’re at home or their career development. Many people who are asked and helping them with their thinking. As long as people who just, and leader, keep that in mind, you still can be very successful in developing more context. Ron: You’ve talked about some of the initial improvements that you made there. What are some other successes that you’ve realized over your time there so far? Mike: People ask me about the successes or the impact question, this being called generous continuous improvements. Thinking is making. I split my answer into two. There’s the visible piece and there’s the invisible piece. The invisible impact is obviously a lot easier to see. What I mean by that is improvements with med in terms of reducing the safety risk for staff, reducing wait times for patients. We’re taking steps out of procurement processes. Taking steps out of various documentation processes. Probably I could spend the next hour giving example after example of improvements the teams worked on. Ron: Let’s dig in a little. Tell me one that you’re extremely proud of? Let’s put it that way. Ron: No, don’t worry. We’re just having a conversation. Mike: I’ll share one that was some of the proudest moments that I had. Some of the proudest moments that I’ve had is when I saw the student become a teacher. That, for me, was [laughs] beautiful. One of my heroes, Dr. Brenda, met her to a podcast last year with a mutual friend, Mark Graban. This woman is the most passionate woman I’ve ever met. She deeply, deeply cares about the mothers that are losing their lives and massive risk by giving birth into the African healthcare system. Just to see her so passionate about developing herself, becoming a better leader, and coaching her colleagues, that gives me the extraordinary sense applied knowing that I’d played a part in her development. My answer truly is seeing her shine and her call to others on this improvement rather than a Pacific improvement that we met on the ground. Hopefully, I didn’t diverge. Ron: No. That’s beautiful. I can even sense in your voice that this is a deeply, almost an emotional topic for you and something that you’re deeply passionate about. This is not about me, but a side story that I can relate to you. Back when I worked in the industry, I worked at a company. I was actually in the UK. We were visiting a facility, and saw a young man. He was working the night shift. He was, I don’t know, 25 years old. Big smile, I’d never forget the look on his face. Walked up to him before we were leaving that evening and shook his hand, and asked him what he was going to be doing. He told us some of the things that he had planned for that evening. There were just a few folks working that evening. The next morning, we pulled up. There was closed-circuit TV all over the place and police everywhere. Come to find out that there was an accident. I won’t get to any details, but he passed away because of his situation. It chokes me up, thinking about it today. There were things that probably could have been done better from, say, a continuous improvement perspective, whether it’s standard work or whether it’s just various processes that could’ve been improved. I personally feel some responsibility for that, because I was part of that leadership team that we’re putting these programs in place. Make no mistake that the work that we do as continuous improvement practitioners can have life and death impact, not just in a hospital, in a factory or wherever it might be. I can hear that in your voice, in how important the work that you’re doing. Keep it up. I know the next thing I want to transition into is some of the challenges that you’re feeling and that you face. Why don’t you talk a little bit about that, Mike? Mike: First of all, thanks for sharing, Ron. I don’t want this podcast to be exclusive about healthcare or Africa. Some of the lessons I’m learning here and we’re sharing here and discussing are very applicable in our communities where we live throughout the world. Once again, about a year ago, I may have answered differently. A year ago, I may have point this to the obvious, which would be the lack of resources, the fact that I’m the only Lean coach or healthcare provider of 450 so people. I would point that things that are people as biggest challenges. Where I am now, I am very proud of this answer of what my biggest challenge truly is, and it is me. We have found the enemy, and it is I. The biggest challenge is me. The biggest reason why this organization hasn’t developed as fast enough on its continuous improvement journey is because of me, because of my limitations as a coach. There are advantages and disadvantages to that realization. Realizing that my own development and the fanatically developing in myself will allow me to contribute better to the organization and drive the organization forward is something that’s within my control. It’s very easy to point outside, but the biggest challenges are my own limitations. Me and you and others listening to this may be perceived as experts, but I’m certainly a lifelong student of continuous improvement. The day I say that I master this is the day I stop learning and the day I stop leading and stop influencing others. There’s so much in this body of knowledge that we call continuous improvement. The better I get at this, the more effective I can be at supporting some of the managers and doctors that I work with on a day to day basis. Ron: Sometimes I feel like the more that I learn, the more that I realize I don’t know. It’s funny you say that, because Kevin and I were joking the other day. Even within Gemba Academy, we do our very best to practice Lean principles throughout our company and documentation and standard work and so forth. We have struggles. We’re not perfect. We’re not invaluable. It’s like, we can teach other people, but it’s hard to do it yourself. Just something that I wanted to ask you is, and you led onto this a little bit earlier. Why are you doing this, Mike? Obviously, you’re a talented young man who could be doing also additional incredible work. You’re obviously doing incredible work now, but you could be doing incredible work anywhere in the world. Mike: I spent a lot of time reflecting on this. At different stages of my life, I had a different answer to this, just like my last answers. I’m going to use this opportunity to share my faith, my faith and God. I believe that it’s God’s purpose for my life to be here at this season of my life. I believe that He created this opportunity to see people in tremendous suffering. As a part of my mission here on Earth, He wants me to do something about. The more I give, the more I get back, in a way. I mean that all respect to my fantastic colleagues that I work with in North America and Europe. Tomorrow, I’ve got a coaching appointment with my one of my favorite people, Dr. Fatima. She goes through so much adversity. She works in one of the government hospitals and helping coaching clinical skills on maternal health. This woman sees death every single day, another tragic loss of a child, of a mother. 99 percent of the cases, avoidable, avoidable, avoidable. I’m one of the very few resources that she has, that she can talk about these things. I help with her with the various challenges she has in trying to influence others. This woman is my hero. She goes through so much challenges and adversity in her week. Knowing that I somehow helped her in her journey to be more effective or more efficient just gives me strong satisfaction. The one-liner is why I’m here, I believe, and I won’t know until I die, but I believe this is part of my own destiny, part of my own vision. For this season of my life, I’ve been so lucky with the times that I’ve been given and the development I got today, and I’m still growing, but this season is to give back and to contribute. There’s massive challenges living in this part of the world, but it’s still the best — definitely, in terms of career, the best, and spiritually – decision I’ve ever made. I think you’re truly living those words there. I really admire you for that, Mike, and hope you’ll continue. How long do you plan to stay? Do you have any ideas? Mike: I don’t want to let CCBRT down. The CCBRT, the hospital I work with here, I think failure on my end if I don’t leave them with habits whenever I do this item, that if the senior leaders, those key, talk and the directors, the heads of departments, those key people, a few people I influence. If they don’t have change of habits, those continuous improvement habits, after I leave, I think I failed. In addition, if I haven’t set them up with other support, whether it be from people listening to this podcast or other people that I connect with last year and a half or so, almost two years, then I’ve also failed. If it dies after I leave, that’s a sign of failure. I think that that’s important. I can’t leave until I put them in a place where they can continue on this journey. I don’t fully know the answer, but I can say with a bit of certainty that I’m not ready to go back to the developed world. If I do leave Africa or leave this particular assignment, I would like to stay in a developing world context, whether it be somewhere in Asia or elsewhere in Africa, just because that I get so much satisfaction out of seeing people grow and develop and contributing to someone that’s bigger than self, advancing society. This is still a question mark. Sorry, Mom, if you’re listening to this. Ron: I can imagine how incredibly proud she is of you, though. Goodness gracious. What do you do for fun? What does a Friday night look like? Mike: [laughs] I just had lunch with some friends today, or discussing what Africa does to you. Three of us came to the conclusion that Africa, or this life that we’re living here as expats, it exposes things of your character that you never knew existed. I’ll be totally honest. This is one of the most challenging seasons of my life. I have been at very many low points, but at the same time, it is the greatest spirit of growth in my life. I’m going back to what I said earlier. I do not regret for an instant what I’ve done. Essentially, I thought it was loneliness at first. I will repeat it back later to you. It’s an important message to share. I thought it was loneliness at first, but it really wasn’t loneliness that I was suffering from. It was essentially that I didn’t know how to manage being on my own.Yes, when you do come to places like this, you get a lot of down time on your own. There are many dangers that come with that. In those times, you get to figure out what’s most important or figuring out so much stuff about yourself. I really feel this experience is going to be back so much more than I can give back in terms of learning about myself and understanding what’s most important, putting first things first. I’ve certainly matured. Probably, more so in this year and a half than the 10 year before that. Maybe I didn’t answer your question, but certainly, there are absolutely so much avenues. There’s still a big expat population here. Even though I’m recovering from food poisoning the last few days, I do play soccer about two or three times a week. I got some great friends both at work and outside of work. It’s certainly different. It’s not like a night out in Philly. Ron: We’re recording this right now in the middle of July. It will be released a few weeks later. The World Cup is in full swing, and we have our final now with Argentina and Germany. Are you guys following the World Cup? Mike: Oh, yeah. It’s fantastic to see how passionate the Africans get over football. I’m sure they were very disappointed when their representatives didn’t progress further, but yeah, it’s a beautiful sport. I used to get depressed about sports. [laughs] I’m sure a lot of listeners do when their team doesn’t get through, or whatever disappointment. But this experience in Africa has shown me, it’s perspective. Mike, the last question I have for you in this section is, what can people do that are listening to this right now? I can’t imagine if someone has listened to this point of the show, that they’re not touched by your words, and the work, and your mission that you are doing over there. What can people do to help? Mike: I’ve thought a lot about this, and previous answers would have been come to Africa. Quit your job, move your kids over. I know, I’m realistic here, I know for 99.99 percent of listeners that’s not possible. Maybe my message is not necessarily to my cause here in Africa, but maybe is the higher level cause, that sense of contribution to society. Yes, of course maybe we’ll share details of that foundation in North America where people can contribute to it. I would love, like when Kevin was here and many others. We have John Tucson from the center for healthcare coming here later in August, and many other visitors have come. I open up those doors to people to directly contact me if you want to spend some time here. But for those who can’t spend time, or can’t quit everything and move over, I will ask them to reflect on their own communities and organizations. Because this continuous improvement thing is pretty special. It’s golden. We know it works. How can we give back? Ron: Are there websites people can visit to learn more? We will link to everything in this show notes. I don’t want to call out the show notes number right now because I’m not exactly sure what those will be. I will have those in the intro and the outro of this episode. But where can people go to learn more? Mike: Obviously the CCBRT website which I’ll give, the Kupona Foundation websites. I’ll give my personal website, I’m on LinkedIn. Ron: Go ahead give one right now, at least. Just call it out for someone who is listening to iTunes on an airplane. Mike: Hopefully I won’t butcher the spelling, because it’s one of my strengths. Ron: Type it into your browser. We can edit this pause out. Don’t worry. Mike: I’ve written a blog on it as well. It’s our presence in North America. Ron: What’s your website, your blog website? Mike: My personal website is MikeGroganConsulting.com. It’s probably best to connect with me via LinkedIn. Ron: We’ll have all those links in the show notes, so that’s fantastic. Let’s go ahead and transition now into the quick fire section. We’re going to keep digging in and learning more about who you are, Mike. The first question, and we’ve spent a lot of time talking about this already, but I want to keep exploring it because it’s such a powerful topic. We lean practitioners, we spend a lot of time talking about the importance of respect for people. It’s one of the pillars of what we do here as lean thinkers. But if you were to explain what respect for people is or define it, it can be tough. What does that mean? What does respect for people mean to you, Mike? Mike: I could spend the next hour. This is my favorite principle of lean thinking, respect for people. Because without it, nothing is sustainable. Actually, my good friend, a fellow interviewee that you interviewed, Joel Gross. Mike: On his fantastic web page, I was a guest blogger, a writer on that. I wrote a more detailed answer. Ron: I’ll link to that, but I’m going to put you on the spot now. You’ve got to give us an elevator speech on respect for people. Mike: Here’s the 60 second elevator. I prefer the phrase respect for humanity. Ron: John Miller actually explained that’s better, as you heard on that episode. Mike: Fantastic lean thinker, John. It really goes back, you’ve really got to care about your people. You really must have the belief that the greatest resource in your organization is human potential, and that you really must be conscious and look at this from a manager perspective, how your actions and behaviors have an impact, a direct impact on the quality of life of your employee. If people don’t appreciate that, that’s the first problem to solve. If they don’t make that link, I’d even push people as far as if you don’t feel that you care about your people, you don’t think that people are your greatest resource, then maybe you’re in the wrong job. Maybe you have to deeply reflect, because I know we have assets, we have machines, whatever it may be, but if it’s people that leave a legacy, not the buildings or equipment. One of my favorite writers or thinkers on human development, human models is Tony Robbins. I’m addicted to his stuff, but he talks about the six human needs — certainty, variation, significance, connection/love, rules and contributions. I think that there’s a beautiful link there to respect for humanity, in terms for the manager, and of course be aware of those human needs and to do actions that add value to those needs, and not detract from them. I can talk for hours and hours, but that’s the gist of it. Ron: That’s excellent. Everything you said so far, we’ve been talking for 30 minutes or so, it’s all about respecting people, what you’re doing over there. That’s fantastic. Mike, what’s one problem that you’re currently trying to solve? Mike: I’m looking introspectively, and I think the problem I’m trying to solve is how can I become more effective at Gemba with dialogues with the senior executives that I’m working with? I’m really reflecting on how I learned that continuous approval is always the most effective way, and I really believe that the most effective aha moments and experiences came from one on one with my sensei at the place of work. I’m trying to master those times I have with those leaders. Some of those experiments, I’m very excited because they create a pull where they want to meet me more frequently. Some, I haven’t got as much pull, so I’m trying to master, how can I develop a standard work for those kind of jobs, so that a leader finds they get this certain value. At a very high level, essentially I’m asking three questions all the time, and that is the process. What is the operation standard? How do we know if it’s working, as in what is the management standard, and how are we improving these standards? I do want to master the standard work and become a more effective coach in those kind of work, so I am doing a lot of self reflection on that. Ron: Mike, what’s the best advice you ever received? Ron: Who told you that, your mom? Mike: I’m sure I did too much talking when I was a kid. I actually credit this to a guy named Ron Webber, a master black belt in a former company. Ron was a fantastic LSS teacher, and the most impactful advice was, maybe I’ve got better advice, but this advice was the single most stickiest advice I’ve ever got. Because it made me reflect, and there’s not an instant where I teach, whether in a classroom or in a one on one, where somehow the words come back to me. “No Michael, you need to listen more, you need to listen more, you need to sympathize more, you need to empathize more.” I know the problem many people have, and maybe now I talk too much, the sound of my charming Irish voice is not what everyone wants to hear all the time. Ron: Your accent is definitely cooler than mine, so I’d rather you talk to me. Somebody told me a long time ago, I don’t remember who it was, that God gave us two ears and one mouth, use it in that proportion. [laughs] Wonderful. Next question. Do you have a personal productivity habit that others might benefit from? Mike: Yes. Many, many. But because you’re asking, the most impactful ones, I would say it’s the application of data and getting things done has had an extraordinary impact on my productivity. There’s a great book by Charles Dewey called “The Power of Habits,” and in the book he talks about keystone habits. In a nutshell, keystone habits are certain habits that have a fertilizer impact on other habits. So for getting things done, there are loads of great things in the getting things done system. But if there are two keystone habits that really drive productivity is never, ever keep anything in your head for the rest of your life, and emptying your inbox every 24 to 48 hours. Sometimes people laugh at me, because I’m always walking around with a pen and paper. Sometimes, when I used to drive to work, if an idea came into my mind, I would pull over and write the idea down into my iPhone or whatever tool I had at the time. It is the worst place you can store things, in your mind. Ron: I use my voice recorder on my iPhone. I hit the record button while I’m driving, and I will talk into it and remember it that way. Mike: I’ve got two more things. From an effectiveness perspective, I also encourage people to study habit number three of the seven habits, putting first things first. That’s part of the material. I really believe that the application of that material has changed my life. To highlight one thing out of it, the importance of the “not to do” list. It was Peter Drucker who said us coaches we had a tendency to tell people what to do, where instead we should be focusing on what not to do. So for me, I have a very active “not to do” list which I often add to through my reflection sessions. But knowing what not to say no to is an extraordinary sense of power, because you say “Yes” to what’s most important. Ron: Mike, if you could recommend one book related to continuous improvement or leadership, what would it be and why? Mike: “The Seven Habits of Highly Effective People.” I’ve read it probably eight times. I’m not trying to boast, but I think people need to. A good friend of mine said recently, I’m in the habit of reading a vast amount of material. Which is good, but there’s still a huge gap between what I know and what I do. It’s essentially one of the biggest gaps in the world, between knowing and doing. I’m trying to get into the habit of those few key books, to go back and maybe every year, every six months for certain books, to go back and re-read. I have another couple of books that I recommend in particular, continuous improvement books. Regardless of where you are, and I’ve had friends who are nurses, to pastors, to doctors, coaches, podcast interviewers. Wherever you are at a stage in life, the seven habits is just an extraordinary amount of material in that. The application of it has changed my life, in that I know listening to previous people who give interviews, they’ve been tortured by this because they’ve got so many. But apart from that, I’d like to. Ron: Go ahead, no problem. Mike: In the classic continuous approval world, number one is two books that fundamentally changed my thinking. “Toyota Kata,” there’s enough written about that by your previous interviewees, so I won’t add to it anymore. You have to read it, people. And number two, some book that hasn’t got as much attention, but it’s a book called “Creating a Lean Culture” by David Mann. That book is focused on management systems, and I really believe when I look back on the many lean transition failures, or failed results, that it links back to the absence of a lean management system. Leaders not having the tools, and not knowing what behaviors they need to do. For those listeners that are in healthcare, maybe David Mann’s book would be useful, but I hope people are not turned off by the manufacturing examples. But if you want a pure healthcare industry example, Kim’s book is fantastic. “Beyond Heroes”, I want to add that as well. Ron: Not to put you on the spot. This isn’t even a fair question, I shouldn’t even ask it, but I’m going to anyhow. Do you think “Toyota Kata” might be the best lean thinking book ever written? Mike: I’m going to steal a phrase my good friend Joel said, Joel Gross, and it depends where you are in your journey to read a book. If it’s the first book you read, I don’t think you may get as much value. Just like I’ve never done an MBA, but from speaking to people who have done MBA, they are grateful they’ve done it after they have a certain amount of years in the industry, they reflect on it. Why “Toyota Kata” was so powerful for me was because I could reflect on all of my failures, and all of the time of success and failures, whatever it may be. Because of that, I took so much out of it. Ron: That makes perfect sense. So yeah, maybe have a bit of a journey and then go to it. Yeah, excellent. Last question, Mike. Imagine that you’ve been hired as the general manager of a company that’s struggling with quality, productivity, hourly, it’s just a mess. You were hired because obviously your incredible background and experiences and past success. As it turns out, the CEO that hired you is giving you complete operational control and trust, yet you are going to right the ship. So with this said, what would your first week on the job look like? What would you do, and why? Mike: I listened to all the answers of all the previous TSO people that you’ve interviewed, and part of me thinks “Do I say the same thing, or do you want me to try to come up with something different?” In a nutshell, things previous people have answered about the goal set mindset, sympathize, empathize, observations, talking to clients, staff and stakeholders. If I were to pinpoint what I would try to do in the first week, I would try to get as much one on one time with my direct reports as I could. One on one time would include both in the office and in the Gemba, because I really want them to know who I am. I would spend much time with not just direct reports, but other frontline workers, as much time learning and listening in the first week. Outside of that first week, I would as best I can try to develop models. What I mean by that is an inch wide, mile deep experiment on a lean management system focused on a business problem. Maybe that lean management system may be with my team, maybe that’s in a particular department, but doing my best to show what good looks like, in terms of not just systems, but the behaviors that go with it. That would be one of the key things that I would do in the first week. Ron: Mike, thank you so much for coming onto the show. Just let me say, on behalf of everyone listening to this, perhaps they would like to say this to you. Again, they can send you an email, but thank you for everything that you’re doing for the people over there. You’re doing work that truly matters, and so I’m really inspired by you and what you’re doing there. Why don’t we wrap this show up, Mike, with you sharing some final words of wisdom? Then tell people again how they can connect with you via your favorite social media outlets. Mike: In terms of final words that I would share with people, perhaps one of the reasons that people listened to this podcast was that all of us have got something in common, and that’s our passion for continuous improvement. But I don’t want people to listen to this because of, perhaps, the interest in my story, of some guy who quit his job in the corporate world and moved to Africa. I really don’t want people to have that takeaway that this was about me. I really want them to reflect to themselves about their story and to get spiritual or to get really deep, but it’s essentially what are you going to do with the rest of your life? If we’re brutally honest, the vast majority of people do not have a great life. The vast majority of people do not reach their potential. The vast majority of people do not fulfill their destiny. Now, I want to make a clear definition between yeah, people may be successful, but there’s a huge difference between being successful and reaching your potential. So many people towards the end of their life live with so many regrets. A study was done some time ago about what the three biggest life regrets. They said the three biggest life regrets can be categorized into I didn’t take enough risks, I didn’t reflect enough, and I didn’t do enough things that would live on long after I’m gone, a legacy. This podcast was not necessarily about encouraging people to quit and move to Africa. I really want people to reflect on the gifts they’ve been given. They can act. There is so much time, and there is time to act. The two actions I ask people to reflect on is growth, your own personal growth. The greatest investment you can make in life is yourself, as Benjamin Franklin said. Expanding your capacity, expanding your capability, your understanding of this beautiful thing of continuous improvements that we are so fortunate, because the more you can invest in yourself, the more you can give back, the more you can contribute to society, to advancing society. Especially in developing people, and history has shown us so much, there’s so much data to show, that it’s the greatest way we can advance a society, whether that be our children or our communities. The heartbreak that’s happening in Africa right now is by developing people. That’s proven time and time again. These goals that we have of continuous improvement, the world is in desperate, desperate need for it. Once again, I’m not asking people…I welcome people to connect with me if they’re interested in coming for a period of time. Look around in their own communities, whether it be their local churches, local not-for-profits, their library, whatever it may be. Opportunities are, some of them even in their own company, to mentor, to share, to share this knowledge with, to experiment on ways that they can give back. I really believe to have a fulfilled life, to live the purpose, we must grow and contribute. That really is the ingredients or the formula a great life of reaching your potential and setting your destiny. Ron: You mentioned earlier LinkedIn was the best way to get you? Mike: Most people are on LinkedIn. Ron: It’s Mike Grogan, right, or is it Michael? Mike: It’s both. I put both in, in case you mis-search me. Mike Grogan or Michael Grogan, you’ll be able to find me, as well as I’ll give a link to my own personal website, Mike Grogan Consulting, and the component website, CCBRT website, and my own personal email, which I’m sure have the show notes. These are many ways to connect with me. Ron: Thanks again, Mike, for everything that you’re doing. Again, Gemba Academy customers, keep your eye peeled, because we’re going to bring Mike to life in video here. Probably within the next month, we’ll have some footage up of Kevin’s visit with you there in Africa. Ron: Keep up the good work, my man. Keep fighting, keep doing the work that you’re doing, because it truly is incredible. You really do inspire me. Mike: I appreciate it, Ron, but I’m very humble the way I am. I’m so lucky to get this opportunity. I feel very fortunate, and I appreciate your comments. Announcer: Thanks for listening to the Gemba Academy podcast. Now, it’s time to take a free, no strings attached, fully functional test drive of Gemba Academy’s school of Lean and Six Sigma over at gembaacademy.com. Gain immediate access to more than 500 Lean and Six Sigma training videos free of charge at gembaacademy.com. In what other ways can lean and six sigma be used to help those in need?